You thought you could escape the Cuties? Think again. During the past few weeks the Cuties have been throwing a LOT of things at us, and we mean new features almost every week. They partnered with TRON towards the end of last year and they even united with Gameunculus for a special Christmas giveaway last month. Now, the Cuties have dived into their newest and most unsettling adventure so far: the Wastelands. The team behind these loves has decided to add a new piece of land on January 15th, and it doesn’t have a single cute square meter in it. How is it that your cuties never wandered off to this place? Gameunculus has found out the scoop, and from no other than the old (and apparently very wise) Cutie located at the edge of the Wastelands. So at least we have that to look forward to in our future, wisdom will eventually come. Apparently, a long time ago Cutieland was a peaceful place, everyone living in harmony–bosses and Cutie masters included. One day, loud and horrible noises that came from unknown and far-off places disrupted such peace. Massive fireballs were seen in the sky before they hit the ground, creating explosions that destroyed everything in their paths, leaving nothing but ruins. Here is where the mystery part begins. The massive fireballs turned out to be metal pods from which large mechanic creatures came out to create Cutie mayhem. No Cutie knows anything about them or why they’re here and it’s your job to go fight against them–like our very prepared friend below and find out their purpose before they destroy the entire Cutieland! The Cuties team also announced today the 16th that the new and unwelcomed visitors have become skeptical of the natives, so they have brought their champion with them and the new raid boss will be joining them TODAY. Beware of your surrounding cause he sure looks aggresive. Well, nothing to do but waiting, if you WANT TO GET KILLED! Go and use this time to gear your Cutie up and leave it ready for battle for when the new scary monster above decides to show up. 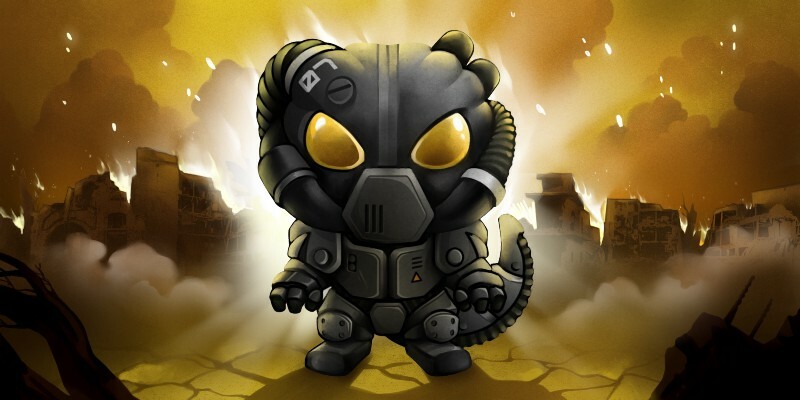 Join Gameunculus Telegram to share all your concerns regarding the imminent end of the Cutieverse as we know it and follow him on Twitter to remain alert!